This is the 349th post on The Racquetball Blog this year, which is a new record for number of posts we've made in a year. It's 35 more than last year's 314, which was the old record. We hope that you've been following along all year, and will continue to do so in 2016. But before we get to the new year, it's time for our annual Top 10 stories of 2015. Without further ado, here they are. 10) Alvaro Beltran - Beltran won his second International Racquetball Tour (IRT) event in October, further solidifying him as one of the great players of this era. Moreover, at the 2015 Pan Am Games, he won gold in the Men's Team event, including defeating Rocky Carson as part of the Men's Team final, and bronze in Men's Doubles. Those were Beltran's 7th and 8th Pan Am Games medals in his career with his first coming back in 1999, when he got bronze with Javier Moreno in Men's Doubles in Winnipeg. However, at 37 and with several young Mexican players coming up, we're uncertain whether Beltran will be in Lima, Peru in four years time for the 2019 Pan Am Games. 9) Sudsy Monchik & Cliff Swain - Sudsy Monchik and Cliff Swain are two of the greatest men's racquetball players ever, and both have now made the transition to coaching. They are arguably the first elite level players to do so (John Ellis is perhaps an exception). 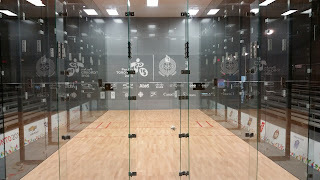 In other sports, coaching has been a common pathway for elite players to pursue after their playing days have ended (although Swain continues to compete), but it hasn't happened much in racquetball, in part because racquetball players have often seemed to have an "I don't need a coach" attitude, which is foolish. Everyone can use help. Fran Davis, who was a top 10 player in the early years of the women's pro tour, and Jim Winterton have been the two premier coaches for several years, but increasing the number of elite level coaches can only be a good thing. We wonder if Cheryl Gudinas could be making the transition Monchik and Swain have made, as she has coached with the US Junior Team for several years. We wonder if any men's pros would look to Gudinas as a potential coach, as in tennis Andy Murray has worked with Amélie Mauresmo. 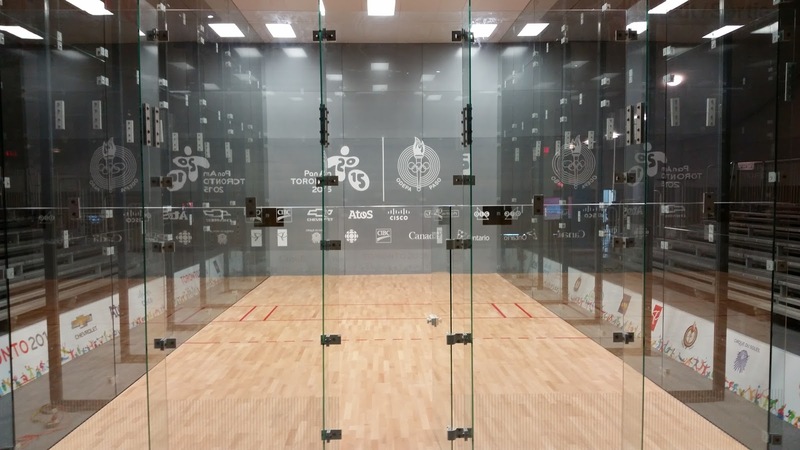 8) 2015 Pan American Games - 2015 saw Toronto host the Pan Am Games, the largest multi-sport event outside of the Summer Olympics, so the largest multi-sport event racquetball is a part of. The hosting was excellent, which everyone who attended can attest to. Sadly, not many people made the effort to attend. The Pan Am Games are part of the multi-sport events that lead up to the Summer Olympics. In the Americas, it began with the Central American Games in 2013, then the Central American and Caribbean Games last year, Pan Ams this year, and next year the Olympics in Rio de Janeiro. The International Olympic Committee (IOC) has changed its policy for including sports in the games, such that hosting cities are able to nominate a small number of sports to include. Thus, if a racquetball nation - the United States or Mexico, say - hosted the Summer Olympics, then racquetball could be included as a potential Olympic medal sport. With Los Angeles as one of the cities bidding for the 2024 Olympics, it's possible that racquetball could be included in those games. Evidence to support that comes from the 2021 World Games, a quadrennial sporting event involving non-Olympic sports, which will be held in Birmingham, Alabama. The Birmingham hosts have stated that racquetball, which has been included in some World Games but not all, will be part of their program. These international events are important, and they influence how racquetball develops in other countries. 7) Veronica Sotomayor - Sotomayor is one of the players who has benefited from Monchik's coaching. He came on board as head coach for Team Ecuador at the Pan Am Games, and has continued to work with them since. Sotomayor earned three bronze medals at Pan Am Games, as well as a silver in Women's Singles at the Pan American Championships, and has been a semi-finalist in both the Ladies Professsional Racquetball Tour (LPRT) events she's played this season. At only 23, there's still a lot of racquetball in Sotomayor's future. 6) Rhonda Rajsich - Rajsich again showed she's a major player in women's racquetball in October, when she reached the US Open final for a women's record 11th time. In July, Rajsich earned three medals at the Pan Am Games: silver in the Women's Team event and bronze in both Women's Singles and Women's Doubles with Kim Russell-Waselencuk. A solid year for Rajsich, but as she said following the US Open final, "I'm not done." 5) Maria Jose Vargas - Vargas has become the solid #2 player on the LPRT. In five events this season, Vargas has been a finalist three times and a semi-finalist twice. Also, Vargas won a double silver medalist at the 2015 Pan Am Games, earning the medals in Women's Singles and Women's Doubles with Véronique Guillemette. At the 2015 Pan American Championships in Santo Domingo, Vargas was silver medalist in Women's Doubles with Guillemette and bronze medalist in Women's Singles. Vargas has worked with Swain to improve her game, and at only 22, has a bright future in the sport. 4) Rocky Carson - Carson could be racquetball's Captain America, as he again played for his country, winning gold in Men's Singles at the 2015 Pan Am Games, which was a successful defence of the gold medal he won four years ago in Guadalajara. He remains a solid #2 on the International Racquetball Tour (IRT), and came within a whisker of claiming the #1 position at the end of last season. This season Carson has reached the semi-finals or better in the first seven IRT events, including a win in Davison, Michigan. But he's 36, and one wonders how much longer Carson will be able to maintain this level of play. Nonetheless, 2015 was a very good year for him. 3) Kane Waselenchuk - 2015 was a bit of strange year for Waselenchuk, as for much of it he was not the #1 IRT player. Carson was. But Waselenchuk overcame injuries and managed to claim his 10th season ending #1 title, which is extended the record he already had. He also extended his US Open winning streak by winning his 11th US Open in October, and won a second straight IRT US Open doubles title with Ben Croft despite Croft having a significant shoulder injury that hindered his on court effectiveness. Is Waselenchuk the best of all time? We think so, although picking between him Sudsy Monchik and Cliff Swain is like picking between Novak Djokovic, Roger Federer and Rafael Nadal: tricky. But we'd go for Waselenchuk. Our only wish was that his impact was greater outside the game, and that Waselenchuk's greatness was drawing more people to racquetball. 2) Professional Racquetball - Racquetball has had money tournaments dating back to the 1970s at least, and people have pursued elite level play since that time. This has produced some great players, men and women, and helped to fuel the racquetball culture and industry. But the history of professional racquetball is spotty, because the organizations have not always been strong. Both men's and women's pro organizations have had multiple lives. Currently, the women's pro tour (LPRT) is healthy, but men's pro racquetball has fractured with the creation of the World Racquetball Tour (WRT) as a second tour along with the International Racquetball Tour (IRT). We understand there were reasons for starting a second men's pro tour, and initially, the idea may not have been to directly compete with Tier 1 IRT events. But there aren't enough players to support two tours, nor is there enough time to do so. If IRT and WRT events are held on the same weekend, then players have to choose between them. Even if the events aren't on the same weekend, if players spend time and money going to WRT events, then they may not have the resources to go to IRT events when they do happen. This is problematic, and in general, when individual sports, like racquetball, have had multiple tours things have not gone well (see boxing). Men's professional racquetball is better served by being united under one umbrella. We're not sure how the WRT and IRT could come together, but they need to do so, and the sooner they do so, the better off they will be. 1) Paola Longoria - Longoria continues to dominate women's racquetball, and is a superstar in her home country of Mexico, as evidenced by her selection to be the flag carrier for Team Mexico at the Pan Am Games in Toronto, and her inclusion in lists of the top sports figures of 2015 along with the likes of Lionel Messi, Stephan Curry and Novak Djokovic (example A, example B). 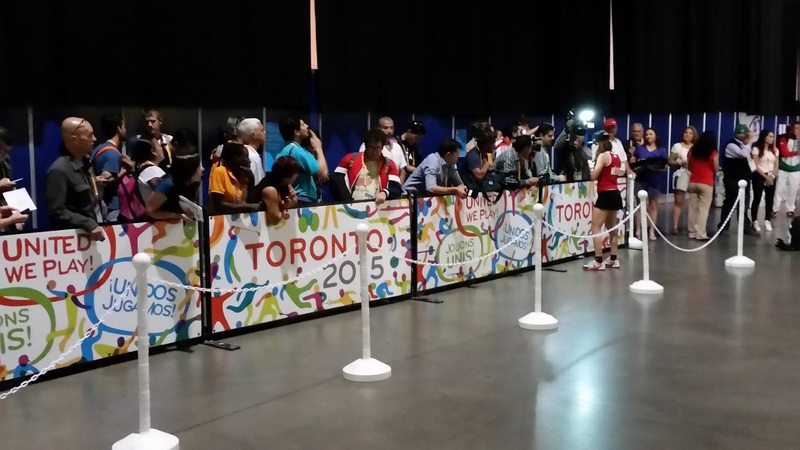 She won three gold medals for Mexico in Toronto: Women's Singles, Women's Doubles, and the Women's Team event (the above photo is of Longoria in the media mixed zone at the Pan Am Games; those people are waiting to talk to her). Longoria's Twitter followers are now over 195k - 195,000! which is dwarfs any other racquetball person or organization; The Racquetball Blog (@racquetballblog) has 1,242. Furthermore, she's not just the #1 player on the Ladies Professional Racquetball Tour (LPRT), but her popularity has led to LPRT events in Mexico with some of them involving Grand Slam level prize money. This is helping to develop more young women players, and raising the level of the game. That's the kind of involvement that will make racquetball bigger, and we applaud it. In 2016, we'll be looking forward to the International Racquetball Federation (IRF) World Championships in July, as well as the Pan American Championships at Easter, the US Open in October, and all the usual suspects on the pro tours. We're looking forward to another good year for racquetball. Carla Muñoz won Women’s Open at the 24th Annual NES Associates Christmas Classic Sunday in Arlington, Virginia by coming back from a game down to defeat Susana Acosta, 11-15, 15-13, 11-2. Muñoz reached the final by defeating Jordan Cooperrider in the semi-finals, 15-12, 15-3, while Acosta needed three games to beat Monserrat Meija, 15-11, 13-15, 11-3, in the other semi. Mauricio Zelada won the Men’s Open final in Arlington by defeating Sebastian Franco, 15-10, 14-15, 11-8. Zelada defeated Brent Walters in one semi, 15-12, 14-15, 11-2, while Franco beat Peter Appel, 15-10, 15-11, in the other. This year’s Christmas Classic had its biggest turnout ever with 175 players competing. Part of its appeal was likely that this was the last year the tournament will be held at the Crystal City Gateway Sport & Health Club, as it’s being changed from a racquetball club to a climbing wall facility. But tournament organizer Karen Turner plans to have the Christmas Classic again next year, although she’ll have to run it in a different location. We wish her luck in making those arrangements, and look forward to its continued inclusion on the Ladies Professional Racquetball Tour (LPRT) schedule. Also on the weekend, Daniel De La Rosa beat Edson Martinez, 11-4, 7-11, 11-3, 11-8, to win the San Luis Open - a Tier 4 event on the International Racquetball Tour (IRT). In the semi-finals, De La Rosa defeated Andree Parrilla, 8-11, 11-3, 11-7, 11-1, and Martinez beat Jordy Alonso, 11-9, 11-8, 11-7. But Alonso had the big win in San Luis, as he knocked off top seed and IRT #3 Alvaro Beltran in the quarterfinals, 12-10, 14-12, 1-11, 11-4. The San Luis Open Women’s Open title went to Jessica Parrilla, who defeated Erin Rivera, 15-4, 15-5, in the final. The pro racquetball tours are all taking a break for Christmas. But they all have events scheduled in January, and we’ll have the action for you then. In the meantime, watch for our year end top 10 racquetball stories of the year. Alejandro Landa defeated Jaime Martell, 15-9, 15-13, to win the Alamo City Open - a World Racquetball Tour (WRT) event - in San Antonio, Texas, Sunday. Landa was a double winner in San Antonio, as he also won the WRT doubles final with Alejandro Cardona by defeating Jake Bredenbeck and David Horn, 15-13, 15-10. The next WRT event will be the Sonora Open, January 28-31, 2016. Paola Longoria the #1 player on the Ladies Professional Racquetball Tour (LPRT) put one of the most dominant performances you're ever likely to see on a racquetball court in the final of the 24th Annual NES Associates Christmas Classic in Arlington, Virginia, as she beat LPRT #2 Maria Jose Vargas, 11-1, 11-1, 11-0. There were only twenty rallies in game one, 21 in game two and a mere 19 in the game three. Vargas only served four times in games one and three and six times in game two. The omen for how the match would go came on the first rally, as Longoria hit a drive serve to the left - Vargas's backhand - for an ace. She hit one more ace that game, and three more in game two, as well as four service winners in the match. Longoria also won the LPRT Doubles event with Alexandra Herrera, as they defeated Susana Acosta and Samantha Salas in the final, 15-8, 15-13, which featured two Mexican teams with one right handed and one left handed player. In game one of the final, they were close early, and then tied at 6-6. From that point Herrera and Longoria got eight straight points, including six on consecutive rallies, which put them on game point at 14-6. Salas hit two winners to fend off the game points, and get the serve back. Two skips by Herrera made the score 14-8, but the left-hander then hit two pinch winners to get the serve back. They won the game on the next rally, as Longoria hit a touch forehand pinch shot in the front court. In game two, Acosta and Salas took an early lead at 3-0, but Herrera and Longoria came back and tied the game 3-3, and went ahead 7-5. Then Acosta and Salas scored the next six points to lead 12-7, and it looked like they were going to force a tie-breaker. But Longoria got her side the serve back by cutting off an Acosta Z serve that was going to Herrera's side with a backhand down the line shot. With the serve back, Herrera hit a Z serve to Acosta that she didn't return, and followed that up with winners in three of the next four rallies. In the other of those rallies ended with a winner from Longoria, and the score was tied 12-12. Another Longoria winner put them ahead 13-12. But Herrera was forced into skipping a forehand on the next rally, giving the serve back to Acosta and Salas, who tied the score at 13-13 after Acosta hit a forehand reverse pinch. Salas then skipped a ball, losing their side the serve, so they called timeout. But that didn't help Acosta and Salas, as Longoria hit a pinch shot from the front court to make it 14-13, and got the game winner with a forehand cross court shot that cracked out along the left side wall, 15-13. The next LPRT event will be the Mercedes Benz of Cincinnati Pro-Am in Cincinnati, Ohio, January 29-31, 2016. Two surprise finalists in Men's Singles at the Alamo City Open - a World Racquetball Tour (WRT) event - in San Antonio, Texas, as 4th seed Jaime Martell and 7th seed Alejandro Landa knocked off the #1 and #2 seeds enroute to the final. Martell defeated #1 seed Alejandro Cardona, 15-14, 4-15, 11-5, to reach a second consecutive WRT final, while Landa knocked off Jake Bredenbeck, 15-12, 15-14, in the other semi-final. The singles final is noon Sunday. You can watch the action via the WRT website. Number one will play number two in the final of the Ladies Professional Racquetball Tour (LPRT) 24th Annual NES Associates Christmas Classic in Arlington, Virginia, as LPRT #1 Paola Longoria and #2 Maria Jose Vargas won their respective semi-final matches on Saturday. Both advanced to the final in three straight games. Longoria defeated Samantha Salas, 11-1, 11-6, 11-7, while Vargas beat Veronica Sotomayor in three close games, 12-10, 11-7, 11-9. For Sotomayor, it was a case of "what if?" as she was up in all three games against Vargas, yet lost each one. In game one, Sotomayor was ahead 3-1. Vargas tied it at 3-3, and Sotomayor went ahead again 9-5. Then it was Vargas's turn to come back and tie it at 9-9, and then go ahead 10-9. Sotomayor fought off three game points, and then tied Vargas at 10-10 with a drive serve ace to the left side. However, she skipped a forehand shot on the next rally, giving the serve back to Vargas. Vargas hit her own ace drive serve to the left to make it 11-10, and won the game when Sotomayor skipped a backhand shot on the next rally. Sotomayor was undeterred, as she took a 7-2 lead in game two. Yet Vargas held her at seven, and scored nine unanswered points to win 11-7. And impressively, Vargas scored those points on nine straight rallies. Sotomayor took a timeout when she still led at 7-5, but that didn't change the momentum. In fact, Vargas hit an ace drive serve to the left, when play resumed after that timeout. At that point, you could understand if Sotomayor just rolled over in game three. But she didn't. In fact, Sotomayor took an 8-0 lead in game three. Vargas took her second timeout at that point, and got the serve back on the next rally with a forehand winner. That led to ten unanswered points (not on consecutive rallies), so Vargas led 10-8. Sotomayor fought off two match points, and scored one of her own to make it 10-9. Then it seemed Vargas had won the game, and match, but Sotomayor appealed the serve, and the line judges ruled the serve had been short. Thus, the rally was replayed. However, on the ensuing rally, Vargas hit a clean forehand kill shot that ended the game and match. A similar story line unfurled in the other semi-final after Longoria won the first game comfortably at 11-1. In game two, Salas the lead at 6-3. Longoria took a timeout at that point. They went back and forth after that, and then Longoria got a point when she saved a rally by hitting a weak shot into the back wall that barely made the front wall. Salas ran up to get it, but skipped her shot, making the score 6-4 with Longoria serving. Longoria won the next six rallies to make the score 10-6, and won it on her second game point with a backhand re-kill. But Salas took the lead in game three at 6-1. Longoria tied it at 6-6, and they were tied at 7-7 also. A Salas backhand skip gave Longoria the lead that she would not give up. Longoria hit a drive serve ace to the left, and then got a service winner with another drive serve to the left, Salas's backhand. The game winning point came with a forehand cross court that ended a long rally that featured some of the many good gets Salas made throughout the match. Longoria and Salas will face off again on Sunday, as they are on opposing doubles teams in the Women's Doubles final. Salas had the more difficult route to the doubles final, as she and Susana Acosta needed three games to defeat Cristina Amaya and Sofia Rascon, 15-5, 3-15, 11-7, while Longoria and Alexandra Herrera beat Sotomayor and Vargas in the other semi, 15-9, 15-3. That second semi had a scary incident early in game one at 2-2, when Vargas - going for a overhead cross court shot - hit Longoria in the side of the head knocking her eye guards flying. She immediately bent over and remained like that for some time. However, when she left the court on an injury timeout, it was clear that thankfully Longoria hadn't been cut on the play. She continued, and seemed to be unaffected by the incident during the rest of the match. It looked like Amaya and Rascon were going to complete the comeback early in the tie-breaker of their match, as they were up 6-2. But a timeout by Acosta and Salas at that point led to a sideout via an Acosta cross court shot, and then they scored eight points before they gave up the serve. Several of those points began with Salas hitting straight drive serves down the right side glass wall to Rascon. With the serve back, Amaya hit an ace drive serve to the left. But they lost the next two rallies to give Acosta and Salas another match point opportunity. They won it when Acosta hit a backhand wide angle pass in the front court. The singles final is Sunday at 11 AM with the doubles final at noon; times are eastern. You can watch matches live from Arlington via the LPRT Livestream channel. The quarterfinals of the Ladies Professional Racquetball Tour (LPRT) 24th Annual NES Associates Christmas Classic in Arlington, Virginia were marked by some close games, and one upset victory, as Veronica Sotomayor defeated 3rd seed Rhonda Rajsich, 11-4, 11-7, 4-11, 13-11. Only top seed Paola Longoria didn't need to play a game that went past 11, as she defeated Sofia Rascon in three straight games, 11-6, 11-6, 11-2. Second seed Maria Jose Vargas needed four games to fend off Alexandra Herrera, 12-10, 11-5, 3-11, 12-10. Finally, Samantha Salas won in three games over Frédérique Lambert but needed extra points in the third game, winning 11-3, 11-8, 13-11. Sotomayor won the first game against Rajsich comfortably, but found herself down early in game two, 4-0. But Sotomayor came back to tie it 4-4, and then went ahead 6-5, and kept the lead as she went on to win game two 11-7, finishing it with a backhand pinch. But again Rajsich took the lead early in game three at 6-0, including three drive serve aces to the right side. Rajsich extended the lead to 10-1, but Rajsich skipped a backhand shot on her first game point. Sotomayor took a timeout, and then scored three points before Rajsich got the serve back with a backhand cross court shot. On her second game point, Rajsich hit a loose ceiling ball that came off the right wall, which was a set up for Sotomayor. However, Sotomayor skipped her forehand shot to end the game at 11-4. Game four started slowly. After 27 rallies, the score was only 4-3 in Rasjich's favour. She extended the lead to 6-3, but Sotomayor came back to make it 6-6, and kept scoring to reach to reach 10-6, and put Rajsich on the brink of elimination. Rajsich got the serve back with a great backhand reverse pinch return of a second serve. Rajsich scored three points with three winning shots, making it 10-9 and Sotomayor called timeout. Rajsich skipped a backhand shot, when play resumed, but held off Sotomayor's second match point with a backhand cross court return. Rajsich scored two points with a backhand down the line shot and a forehand down the line shot on the left side to have a game point of her own at 11-10. But a Sotomayor cross court serve return got her the serve back, and she scored three unanswered points - including a drive serve ace to the left side - to win the game and match. A similar story unfolded in the Salas-Lambert match, as Salas won the first game comfortably, but in game two they were close the entire way. Lambert had the lead at 8-6, but she only got one point after that. Credit to her though, as she fought off five game points for Salas before Salas got the winner with a drive Z serve to the right side that Lambert tried unsuccessfully to play to the ball into the back wall to keep it in play. In game three, Salas took the early lead at 4-1, and maintained that at 8-3. However, Lambert fought back to level it at 8-8. As in game two, it took a long time to reach the finish, as 19 rallies went by before Salas ended it at 13-11 with a forehand cross court from a foreword court position. The singles semi-finals are set for 4 PM Saturday with the final on Sunday at 11 AM. You can watch matches live from Arlington via the LPRT Livestream channel. The doubles semis are at 6 PM Saturday and final at noon on Sunday. All times eastern. The Alamo City Open - a World Racquetball Tour (WRT) event - is going on in San Antonio, Texas this weekend. The top eight seeds are all through to the quarterfinals, including #1 seed Alejandro Cardona, who beat Jesus Quevedo, 15-3, 15-4, in the Round of 16. The singles quarterfinals begin at 10:30 AM Saturday with the semi-finals beginning at 5 PM, and final at noon Sunday. You can watch the action via the WRT website. 4) Jaime Martell & Chase Robison v. 5) George Bustos & Ross Smith Jr.
Veronica Sotomayor and Alexandra Herrera were the upset winners in the Round of 16 at the Ladies Professional Racquetball Tour (LPRT) 24th Annual NES Associates Christmas Classic in Arlington, Virginia. Eleventh seed Sotomayor defeated 6th seed Michelle Key in three close games, 11-8, 11-9, 11-7, and Herrera - the 10th seed - got the best of 7th seed Cristina Amaya in four games, 11-6, 10-12, 15-13, 11-1. Top seeds Paola Longoria and Maria Jose Vargas both won their Round of 16 matches easily, handing out one donut each. Longoria beat Masiel Rivera, 11-0, 11-3, 11-1, while Vargas defeated Maria Renee Rodriguez, 11-4, 11-0, 11-6. But 3rd seed Rhonda Rajsich needed four games to fend off 14th seed Carla Muñoz, 11-8, 5-11, 11-6, 11-3. Sotomayor was also an upset winner in doubles, as she's paired with Maria Jose Vargas, which is their first time playing together. Neither has played many LPRT doubles events this year, so their seeding is lower than perhaps it should be, as they are seeded sixth. Thus, they were up against 3rd seeds Michelle Key and Frédérique Lambert, and came out on top in two games, 15-5, 15-13. Sotomayor and Vargas were strong in the match. Lambert also made some great shots, but also made several errors - many forced by her opponents good play. In another upset outcome, it won't be two wins in a row for Sheryl Lotts and Rhonda Rajsich, as they fell to Cristina Amaya and Sofia Rascon, 15-10, 8-15, 11-8. It looked like Lotts and Rajsich would pull out the win early in the tie-breaker, as they took a 5-0 lead. But Amaya and Rascon tied it at 5-5. Lotts and Rajsich pulled ahead again at 8-5, but Amaya and Rascon held them there, and got the last six points of the match, winning the breaker 11-8 when Lotts skipped a backhand shot. The quarterfinals begin at 10 AM Saturday with the semi-finals at 4 PM Saturday and the final on Sunday at 11 AM. You can watch matches live from Arlington via the LPRT Livestream channel. The doubles semis are at 6 PM Saturday and final at noon on Sunday. All times eastern. The Round of 32 is almost complete at the Ladies Professional Racquetball Tour (LPRT) 24th Annual NES Associates Christmas Classic in Arlington, Virginia, and there have been two upset wins. In one, Monserrat Mejia defeated 13th seed Adrienne Haynes, 11-8, 11-7, 12-10. Mejia will play 4th seed Samantha Salas in the Round of 16 later today, as Salas defeated Arrisa Hanson, 11-0, 11-0, 11-3, in the 32s. In the other, Masiel Rivera held on to beat Gabriela Martinez in five games, 11-6, 11-1, 6-11, 9-11, 11-6. Rivera will now face Paola Longoria, the LPRT’s #1 player, in the Round of 16. Longoria and LPRT #2 Maria Jose Vargas both had byes in the 32s. Vargas will face Maria Renee Rodriguez in the 16s after Rodriguez defeated Carolina Luque, 11-1, 11-6, 11-7, in the 32s. The only other five game match so far was between veterans Susana Acosta and Jennifer Saunders. Saunders took the first two games, but Acosta, who has a tendency to play long matches, came back to win the next three, 9-11, 2-11, 11-4, 11-7, 11-6. Acosta faces Sofia Rascon next, as Rascon beat US Junior Team member Jordan Cooperrider, 11-4, 11-3, 11-4. You can watch matches live from Arlington via the LPRT Livestream channel. The webcast will begin with the singles Round of 16 Friday at 3 PM. The quarterfinals begin at 11 AM Saturday with the semi-finals at 4 PM Saturday and the final on Sunday at 11 AM. Doubles matches will also be shown beginning at 7 PM Friday with the quarters; the semis are at 6 PM Saturday and final at noon on Sunday. All times eastern. The 24th Annual NES Associates Christmas Classic - a Ladies Professional Racquetball Tour (LPRT) event - is taking place this weekend in Arlington, Virginia, and 30 players are in the LPRT, including the top 9 LPRT players and 17 of the top 20. Paola Longoria, the LPRT’s #1 player, leads the way, as she’s won all four LPRT main events. LPRT #2 Maria Jose Vargas and #3 Rhonda Rajsich have both been runner up to Longoria twice: Rajsich most recently last month in Monterrey, Mexico as well as at the US Open in October. As has become the LPRT norm, there are several young players in the draw who will be trying to knock off the veterans. Players like Monserrat Mejia who will face veteran Adrienne Haynes right off the hop. Also in the Round of 32, there will be a showdown between two veterans in Susana Acosta and Jennifer Saunders. The winner of Acosta-Saunders will face the winner of Sofia Rascon and Jordan Cooperrider, which should also be a good match. A couple of tasty potential Round of 16 matches are Michelle Key versus Veronica Sotomayor and Cristina Amaya versus Alexandra Herrera. Doubles will also be tasty as the teams have been shaken up some. For example, Longoria and Samanatha Salas, who are the current three time World Champions in Women’s Doubles, are not playing together. Instead, the two right handers have teamed up with two left handers to create two lefty-righty teams that are seeded #1 and #2. Salas is playing with Susana Acosta, a veteran left handed player, and they are top seeds with Longoria and young lefty Alexandra Herrera as the 2nd seeds. Not certain why they’ve chosen to mix it up, and we make no assumption as to whether this is a long term plan. It could simply be a result of Acosta’s usual partner this season - Jessica Parrilla - being absent from Arlington this weekend. Despite the World Championships, Longoria and Salas weren’t coming into Arlington on a winning note, as Sheryl Lotts and Rhonda Rajsich won the last LPRT doubles event in Monterrey, Mexico last month. They are playing together again, and are seeded 4th. Runners up in Monterrey, Michelle Key and Frédérique Lambert are also in the draw, but will be hard pressed to make the semi-finals this weekend, as their quarterfinal opponents are Veronica Sotomayor and Maria Jose Vargas. David Horn won the World Racquetball Tour (WRT) consolation draw at the Monterrey Open in Monterrey, Mexico Sunday by defeating Gerardo Franco in the final, 15-11, 15-8. Horn got a forfeit win over Christian Chavez in the semi-finals, while Franco squeaked by Eduardo Portillo, 15-14, 15-14. Franco also beat Jake Bredenbeck in the quarterfinals, 15-13, 8-15 11-5, so he had good results on the consolation side despite losing the final. Paola Longoria won the Women’s Open draw in Monterrey, defeating Alexandra Herrera, 15-14, 15-14, in the final. In the semis, Longoria beat Monerrat Mejia, 15-2, 15-3, while Herrear defeated Jessica Parrilla, 15-8, 15-9. In Warren, New Jersey, Sebastian Franco won the Rollout New Jersey Open, a Tier 4 event on the International Racquetball Tour (IRT). Franco, the 2nd seed, upset the #1 seed Mauricio Zelada, 11-7, 11-5, 11-6, in the final. To reach the final, Franco beat Sean Klingaman, 11-3, 11-3, 11-2, in one semi-final, while Zelada defeated Travis Aldinger, 11-7, 8-11, 11-1, 11-1, in the other. But Aldinger was a winner in Warren, as he and Thomas Carter won Men’s Open Doubles, defeating Joe and Samuel Kelley in the final, 11-15, 15-9, 11-5. The final was a surprise, as Aldinger and Carter were 4th seeds and the Kelleys were 7th seeds. Aldinger and Carter upset top seeds Franco and Sudsy Monchik in the semi-finals, 8-15, 15-9, 11-2, while the Kelleys beat Jonathan Clay and Klingaman in the other semi, 15-12, 14-15, 11-7. The Kelleys got to the semis by knocking off 2nd seeds Zelada and Troy Warigon, 13-15, 15-8, 11-5, in the quarterfinals. Also in New Jersey, Veronica Sotomayor defeated Masiel Rivera, 15-10, 15-11, in the final of Women’s Open, but Sotomayor and Monchik lost the Mixed Open Doubles final due to injury, so the title went to Franco and Samantha Simmons. Sotomayor and Aimee Ruiz won Women’s Doubles. There are two pro events this weekend. The WRT’s Alamo City Open will happen in San Antonio, Texas, December 11-13, and the Ladies Professional Racquetball Tour (LPRT) 24th Annual NES Associates Christmas Pro-Am in Arlington, Virginia, December 12-14. Andree Parrilla defeated Jaime Martell, 15-11, 15-7, to win his first title on the World Racquetball Tour (WRT) at the Monterrey Open in Monterrey, Mexico on Sunday. Parrilla won his first event in his second WRT final. He was runner up to Alejandro Cardona earlier this year in Cali, Colombia. However, in game one it looked like Martell would win his first WRT event in what was his first WRT final appearance, as Martell had a 10-4 lead. But he seemed to let up slightly in a couple of rallies where he had Parrilla on the run, and with great effort Parrilla ran balls down, which led to a change in momentum. That effort plus the fact Parrilla found a serve that Martell was uncomfortable with - a lob Z to the right side, Martell’s forehand - led to Parrilla outscoring Martell 11-1 to comeback and win game one, 15-11. Game two started slowly, and again Martell took the early lead, but only at 2-0. Parrilla came back and took the lead at 6-3, helped in part by some nice forehand pinch shots. Martell called a timeout at that point, but Parrilla kept the momentum going, and extended his lead to 11-5. Martell got the serve back then, and called another timeout after which the game stalled. Twelve rallies went by with only one point being scored. Martell got that one, which made the score 11-6. Then Parrilla scored three points on consecutive rallies: a forehand kill shot made it 12-6, another forehand pinch shot in the front court put it at 13-6, then forehand cross court shot got Parrilla his first match point at 14-6. Martell asked for a hinder on that last rally, but the ball looked well past him, and the referee did not think there was any hinder. Parrilla hit a lob Z to the right on his first match point, and Martell returned it with an overhead forehand reverse pinch for a winner. Parrilla asked for a hinder, but the referee ruled that he had put himself out of position to the make the next shot, which again looked like the proper call. Martell called a timeout, and as with his previous timeout, the game stalled when play resumed. Martell was impressive in fighting off seven match points, and Parrilla was equally impressive in holding Martell to one point during that period. On his eighth match point, Parrilla was unsure what to serve, so he did something different. Standing on the left side of the service box, from which he often hits a Z to the left, Parrilla hit a half lob to the right side. Martell returned it cross court, and moved into center court, perhaps anticipating that Parrilla would go down the line. However, Parrilla instead hit the ball back to the right side, behind Martell, who ended up on the floor as he tried to in reverse to get the ball. It was a good win for Parrilla, who at only 19 has a bright future in the game. He comes from a racquetball family, as his father has been one of the Mexico national coaches, and is Andree’s coach, and his sister Jessica is a regular on the Ladies Professional Racquetball Tour (LPRT) and has been on the Mexican National Team. Parrilla followed up his win in singles with a win in doubles, as he and David Horn defeated Jake Bredenbeck and Christian Longoria, 15-9, 15-12, in the doubles final. The next WRT event will be in San Antonio, Texas, where the Alamo City Open will happen next weekend, December 11-13. Jaime Martell has reached his first final on the World Racquetball Tour (WRT) with a win over Christian Longoria, 15-4, 15-11, in the semi-finals of the Monterrey Open in Monterrey, Mexico. Martell played steady in the semi, and was never really threatened by Longoria until late in game two, when Longoria match the score close at 14-11. But Martell was able to get the serve back at 14-11 after Longoria blew up a backhand shot that skipped before even getting to the dashed line. On the next rally, Longoria hit a forehand shot that was a big skip, and gave the match to Martell in two straight games. In the final, Martell will face 3rd seed Andree Parrilla, who beat Edson Martinez, 15-13, 15-6, in the other semi-final. Regardless of who wins on Sunday a new WRT Champion will be crowned, as neither Martell or Parrilla have won a WRT event in their young careers. Parrilla could get “the double” Sunday by winning both singles and doubles, as he’s also in the doubles final. Parrilla and David Horn beat 4th seeds Fernando Rios and Jose Daniel Ugalde, 15-8, 15-13, in the semi-finals. Parrilla and Horn will play 2nd seeds Jake Bredenbeck and Christian Longoria in the final, as Bredenbeck and Longoria squeaked past 6th seeds Ruben Estrada and David Ortega, 15-8, 13-15, 11-8. You can see the final live from Monterrey via the WRT website. The final will be at noon Sunday. Edson Martinez has advanced to his first semi-final on the World Racquetball Tour (WRT), as he beat Jordy Alonso, 13-15, 15-9, 11-5, in the quarterfinals of the Monterrey Open in Monterrey, Mexico. In the semis, Martinez will play 3rd seed Andree Parrilla, who was a winner over Nicolai Miramontes, 15-4, 15-9. A new WRT champion will be crowned on Sunday, as Jaime Martell defeated Anthony Herrera, who was the only quarterfinalist in Monterrey who had won a WRT event previously. Martell defeated Herrera, 15-9, 7-15, 11-5. Martell will play Christian Longoria, who was a winner over Rodrigo Montoya after Montoya suffered a knee injury that prevented him from finishing what was a match of two World Junior Champions, as Longoria is the Boy’s U16 World Junior Champion and Montoya the Boy’s U18 World Junior Champion. You can see matches live from Monterrey via the WRT website. The semi-finals will be at 5 PM and 6 PM Saturday and the final at noon Sunday. Two upsets of seismic proportions at the World Racquetball Tour (WRT) Monterrey Open in Monterrey, Mexico, as both the #1 and #2 seeds are out in the Round of 16! Top seed Jake Bredenbeck went down to current World Junior Boy’s U18 Champion Rodrigo Montoya, 15-9, 10-15, 11-8, while second seed David Horn lost in two close games to Edson Martinez, 15-14, 15-14, in a match that we thought would be tight. Montoya and Martinez are both Mexican players. We rated Montoya as having the fifth best record at World Juniors over the past decade, while Martinez won gold in Men’s Doubles at the 2014 Pan American Championships playing with Daniel De La Rosa. In short, they are not slouches. Nevertheless, it’s quite a feat to knock off one of the top seeds in any tournament. Indeed, we’re not sure if there’s been any pro racquetball tournament with both its top seeds losing before the quarterfinals. The upsets started early in the 16s on Friday in Monterrey, as 10th seed Jordy Alonso soundly defeated 7th seed Jose Daniel Ugalde, 15-6, 15-3, and 11th seed Nicolai Miramontes needed three games to get past 6th seed Felipe Muñoz, 9-15, 15-13, 11-8. Thus, four of the eight Round of 16 matches in Monterrey were upsets. In one match that wasn’t 4th seed Anthony Herrera defeated 13th seed Fernando Rios, 15-11, 15-10. Herrera wasn’t as fortunate in doubles, as he and Gerardo Franco - the 3rd seeds - were upset by 6th seeds Ruben Estrada and David Ortega, two more Mexican players who had great junior records, 15-10, 15-14. Next up for Estrada and Ortega will be 2nd seeds Bredenbeck and Christian Longoria, who were winners over 7th seeds Alan Natera and Ramon Yañez, 15-10, 15-14. Live streaming from Monterrey via the WRT website will begin with the quarterfinals Saturday at 10:00 AM. The semi-finals will be at 4 PM and 5 PM Saturday and the final at noon Sunday. First big up upsets at the World Racquetball Tour (WRT) Monterrey Open in Monterrey, Mexico, as 25th seed Ramon Yañez knocks off 8th seed Gerardo Franco, 8-15, 15-10, 11-9. Yañez will now face 9th seed Christian Longoria, who also needed a tie-breaker to advance, as he beat 24th seed Alan Marquez, 15-6, 10-15, 11-2. Two Round of 16 matches to watch for: 4th seed Anthony Herrera versus 13th seed Fernando Rios, and 2nd seed David Horn versus 18th Edson Martinez. All four of those players have medalled for their respective countries in international competitions: Herrera and Horn for the USA, Rios for Ecuador and Martinez for Mexico. Look for live streaming from Monterrey via the WRT website starting with the quarterfinals Saturday at 10:00 AM. The semi-finals will be at 4 PM and 5 PM Saturday and the final at noon Sunday. The World Racquetball Tour (WRT) is back in action this weekend in Monterrey, Mexico where the Monterrey Open is taking place. But Alejandro Cardona is missing from the draw. Cardona has won most of the WRT events the last half of this WRT season, although not the last one. As Jake Bredenbeck defeated Cardona in the final of the Kitsap Splat last month. With Cardona’s absence, Bredenbeck is the top seed in Montrerrey with David Horn 2nd, Andree Parrilla 3rd and Anthony Herrera 4th. The top three seeds are also playing doubles with Horn and Parrilla the #1 seed and Bredenbeck and Christian Longoria #2 seeds. Of note, veteran lefthander Javier Moreno is in the Monterrey draw as the 19th seed. If he wins his first match against Alan Natera, Moreno will face Parrilla - a player about half his age - in the Round of 16.